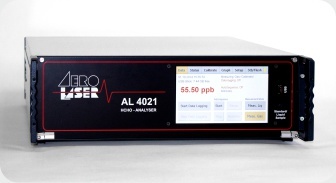 The hydrogen peroxide (H2O2) monitor AL2021 has an extraordinary high sensitivity and a unique low detection limit of <100ppt (parts per trillion) for gaseous samples and <100 ng/liter (eq. 3×10-9 molar) for liquid samples, respectively. The complete chemical processing, including gas stripping, is integrated into the instrument. The measurement process is fully automated, all necessary reagents are provided by a digitally controlled high precision peristaltic pump. The standard dual-channel instrument AL2021 provides absolute concentrations for H2O2 and relative concentrations for all other peroxides. There is a special single-channel version (AL2021SC) for decontamination control and drinking water quality monitoring. The AL4021 is a completely automated and continuously working formaldehyde (HCHO) analyzer for gaseous and liquid samples based on the Hantzsch reaction, which is sensitive to very low concentrations of HCHO (ppbV for gaseous samples and µg/L for liquid samples). All functions of the AL4021 are controlled via a 7" touch screen on the front panel. The AL4021 is easy to use, reliable and has a low need for maintenance. It has an built-in HCHO source for automatic calibration (optional). The AL4021 provides exact and reliable results in free programmable concentration ranges. The AL4021 can store data continuosly on an USB stick. The very fast and extremely sensitive CO-Monitor AL5002 is widely used in remote measuring stations like in Antarctica, on research ships and research air-crafts, where very low detection limits, high sensitivity, fast response, high temperature stability, low zero drift and one huge measuring range is required. The measuring method of the AL5002 is based on the fluorescence of CO in the VUV at 150 nm. The fluorescence light in the wavelength range between 160 nm and 190 nm is detected by a VUV photomultiplier followed by a fast counter.